The Newcastle folks were super cool and sent us (both east AND west coast correspondents!) three each of two new seasonal brews to sample: Winter IPA and Werewolf blood red ale. Let's start with the winter IPA. I must disclaim that I am a bit of a hophead. My first impression of this beer was: it's a Newcastle (apparently the only type of beer they make), so for those of you fond of Newcastle, this one will be a win. The recipe tastes exactly like the standard Newcastle brew, with some subtle hints of hops and maybe wintry spices if you use your imagination. I think they were trying to stick true to the typical Newcastle flavor to avoid distancing their long run customers. Personally, I would have labeled such a brew as an ale or maybe a pale ale, but by San Diego hop mountain standards it falls a bit closer to the ale side of the spectrum. 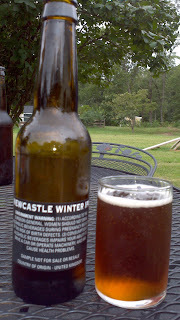 Being an IPA fan, I have a hard time calling this one an IPA, but it's certainly closer than a standard Newcastle. 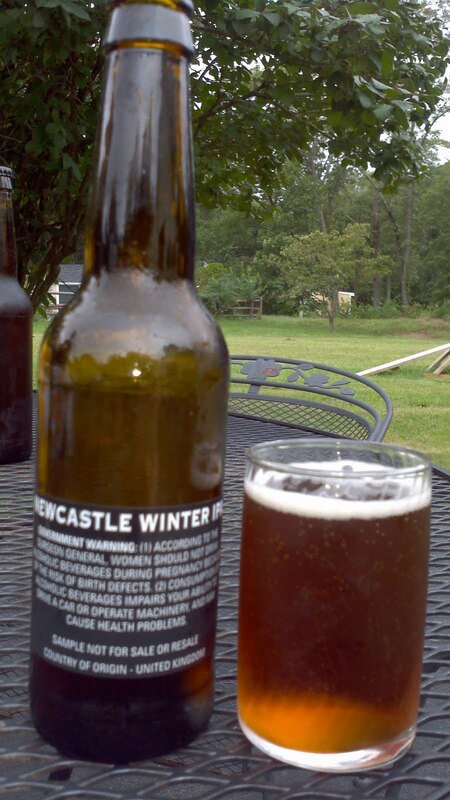 I've come to expect a beer labelled 'winter' to have a bit more spice too, but maybe they're just talking about the season and not the style on that part of the name. All things considered, this was a tasty Newcastle-esque brew with more hops, hints of spice, and perhaps a slightly overambitious name.